A mong the primarily young cast of ‘The Return of Ralahamy’, there is a strong sense of wonderment that a play that was written in the ‘50s could continue to be so thoroughly, even absurdly relevant to modern day politics. The Ralahamy plays were written by De Lanerolle over the late 1940’s to 1957; this play (1954) will be translated to a stage in 2016 almost word for word. The play is being staged by the Creative Arts Foundation, produced and directed by veteran director Jith Peiris. The plot revolves around Dionysius Sumanasekara, a gentleman (or Ralahamy) persuaded to step into the political stage by his revolutionary nephew Somapala Sumanasekara. Somapala’s plan is to ride on the back of his uncle’s popularity for a coveted seat in Parliament-although he may find himself unpleasantly surprised when push comes to shove in this power struggle. We open with Hans Billimoria, a well known actor and director who takes on the role of William Babbington, an Englishman who has “gone native.”Although he’s usually quite cautious about the roles he takes on, Hans is on board this time because of the script, its contents and his fascination with the political animal. Anuruddha Fernando too speaks about theatre reflecting the times it was penned in. “You find that politics were written about in a much more restrained way,” he says. Even though the way of politics in Sri Lanka remains the same today, its temperature has changed, he notes. “So if you’re writing about politics these days you have to be crude. Because that’s exactly what it has become.” Anuruddha plays the title character Dionysius, the gentleman’s politician who knows exactly what makes his country tick and is quite willing to go against his allies once the power is in his hands. Dionysius forms a group of three with his two friends Hajjiyal and Thambipillai. Dionysius’ political wingmen couldn’t be more different if they tried. Hajjiyal will agree with almost anything while Thambipillai is the more cautious one, ever sceptical of his friend’s ideas. Both actors playing the characters are in their 20s-Kasun Maaduwage plays Hajjiyaal while Biman Wimalaratne takes on the role of Thambipillai-and say they find both the humour and relevance of the script a force to be reckoned with. De Lanerolle’s plays however have a markedly small number of pivotal female roles-perhaps reflecting the social strata of the time they were penned in. Piyorina Fernando plays Dionysius’ wife, noting that Mrs Sumanasekara is an upcountry aristocrat, intelligent and educated but a quiet force in her husband’s life. Mayanthi De Silva plays Kamala, Somapala’s wife. Mayanthi is playing a role in a play written about Sri Lanka for the first time and says she is intrigued by the power struggles of the time. She’s joined by Kanishka Herat playing Somapala, the young revolutionary with a plan he hasn’t quite thought through to the end. Will he walk away with the ultimate prize-a seat in Parliament and a role in making the country’s decisions? 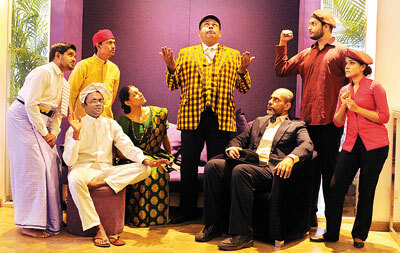 Catch “The Return of Ralahamy” at the Lionel Wendt on 2 and 3 July at 7.30 pm to find out. Tickets and box plan available at the venue.